The Ministry of Commerce and Industries has launched a blockchain based e-marketplace app for coffee. The e-marketplace helps farmers integrate directly with markets in a transparent manner, allowing them to realize fair prices for their produce. 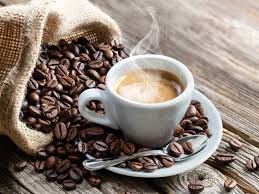 The blockchain technology will help in reducing the number of intermediaries between coffee growers and buyers and help farmers double their income. The blockchain-based marketplace app for trading coffee brings transparency and maintains the traceability of Indian coffee from bean to cup. The blockchain-based marketplace app by facilitating direct access to buyers, it will reduce growers' dependency on intermediaries and help them get a fair price for their produce. The coffee board has collaborated with Eka Plus for the development of the app. India produces one of the best coffees in the world and a considerable portion of it comes from small coffee growers and tribal farmers. Although Indian coffee is highly valued in the world market, the share of farmers in the final returns from coffee is very low. The Blockchain Based e-marketplace app is expected to help farmers in gaining higher returns. Q. The Ministry of Commerce and Industries has launched a blockchain based e-marketplace app for which product? Answer to the above Question is "a"